Artificial intelligence (AI) is much more than a buzzword now, with many companies exploring its capabilities in a wide range of industries. While the technology is still in its infancy, it has contributed to significant advances in many business areas and has the potential to disrupt entire industries. That’s why the worldwide AI market has grown at an impressive rate in recent years. According to the data gathered by Statista, it was worth about $7.35 billion in 2018 and should achieve a remarkable increase in the next decade. For example, the same source also predicts that the market will grow to $89.84 billion. One of the industries that achieved a high level of sophistication and requires AI automation is web development and design. It has been growing exponentially in scale and complexity for over several decades now. That’s why companies are starting to build AI-powered solutions to automate a lot of web development and design work and advance it further. Wait a minute! Does this mean that these solutions will replace human web developers and designers? Whenever we people talk about AI in a particular industry, we mention that technology can create some problems for employees in that industry. It has already taken some jobs (think factory workers). So does it have the power to replace programmers and web page design professionals? In this article, we’re going to answer this question and explore how AI can and is already transforming web development and design. What Is Artificial Intelligence In Web Development And Design? Before we discuss how AI can be applied, let’s briefly review the technology we’re dealing with here. Simply explained, AI is the technology that uses such tools as machine learning to determine and implement web development and design trends and tasks (in web development, it’s often called Artificial Design Intelligence, or ADI). As a result, it can complete web design projects such as websites on its own. The development of this amazing technology has been in progress for less than a decade, but we already have many publicly available website-building platforms that create websites automatically for users. They include such tools as Wix ADI, TheGrid, and Adobe Sensei. The exact number of sites built with them is pretty hard to come by, but each of them has at least half a million subscribers from all over the world. Zorzini concludes by saying that the best option for web development at this point is a human developer/designer because ADI is still in its infancy. So, web designers and developers shouldn’t be worried that AI will replace them? Yes, for now, their jobs are perfectly safe because no technology can compete with the creativity of a professional graphic designer right now. However, this doesn’t mean that AI won’t be impactful in web development and design. Although AI can’t match human skills at this point, there are many ways in which it can transform web development and design. AI-based web development tools can help programmers with automating a wide range of basic tasks, therefore increasing the efficiency of their work. For example, the list of such tasks includes updating database records, adding new records, predicting what code will be used to solve a specific problem and using the predictions to help web developers to select the most appropriate solution faster. Web designers will also benefit from the automation. For example, the aforementioned Adobe Sensei, a tool created by Adobe, aims to improve the efficiency of their workflow. One of the functions of Sensei, Adobe Scene Stitch, identifies a wide range of patterns in an image to assist them with patching, editing, and other related processes. For example, here’s a demonstration of what Scene Switch can do for designers. 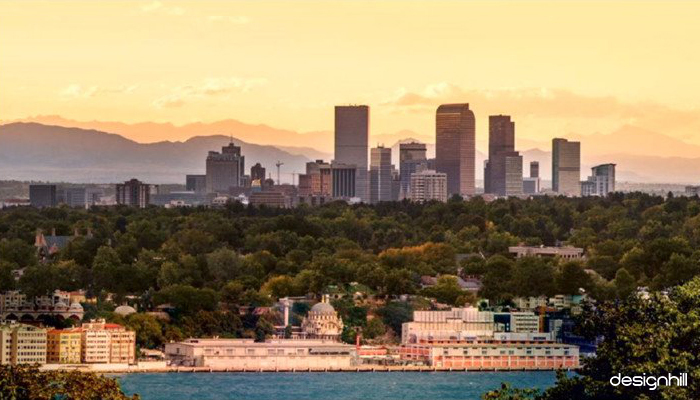 Below is a photo used by Adobe designers at the MAX 2017 conference that needs to be edited. 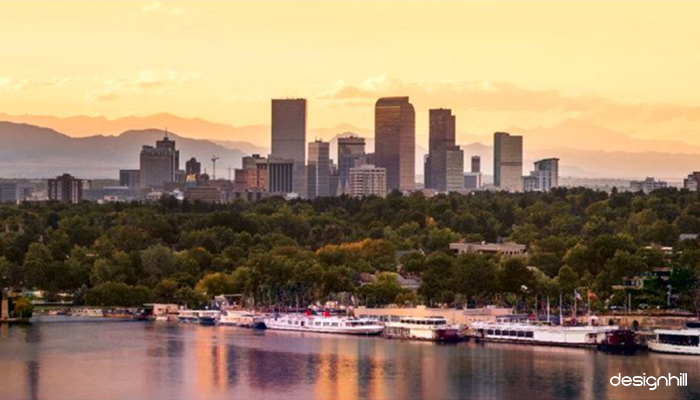 Let’s say you need to remove a section of the image and change it with an image of a river. To help you do that, Scene Stitch looks thorough enormous database of Adobe stock photos and offers options for the final version. Here’s one option it came up with. And here’s another option generated by the tool. Looks awesome, right? These images demonstrate the ability of AI to recognize appropriate images and mix different elements in a way that makes the final image look natural and appealing. And it does so without any assistance from a human designer. Moreover, many of these tools will also be able to generate codes from scratch, which can improve turnaround time. 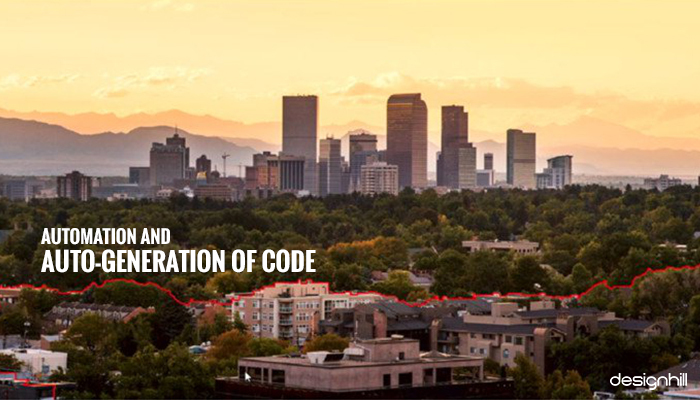 Website-building tools are a perfect example of the ability of AI to create a fully-functional code without any human intervention. If you’ve contacted an online business recently, the chances are that you interacted with a chatbot. It’s an AI-powered application that mimics the conversion of a human being, so more and more websites adopt chatbots to improve the experience of visitors on their sites. 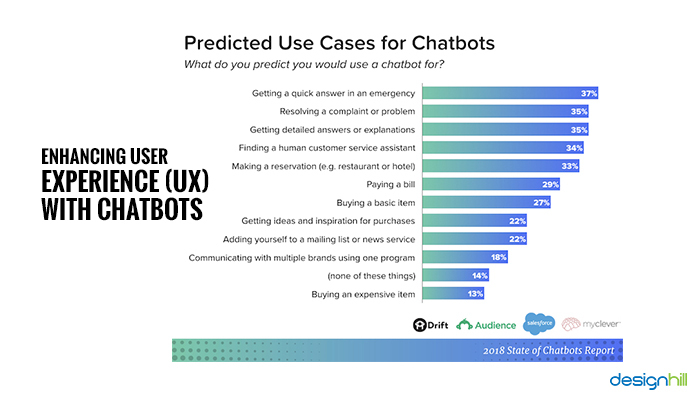 For example, the 2018 State of Chatbots report outlined the following predicted use cases for chatbots in the next years. AI-powered tools are already learning how people draw and create, so the algorithm-driven design isn’t something that we have to wait for. Let’s consider designing a logo. Creating a logo is one of the common tasks web designers face in graphic design services, but AI can help by generating mockups, finding inspiration, and editing. 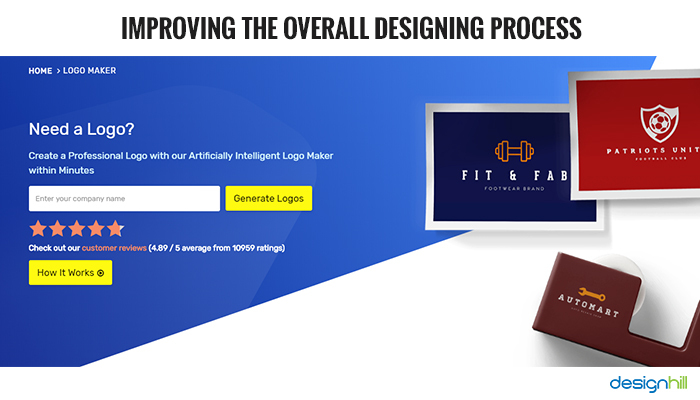 Take our own AI-powered online logo maker for example. Algorithm-driven design allows it to learn from each user; for example, it leaned and analyzed thousands of patterns of font types, colors, sizes, layouts, and other factors. As a result, it identified the most common features chosen by the users by evaluating the usage stats. All thanks to machine learning! To create your own logo design with Designhill’s free logo maker tool, you need to enter your company’s name and generate options. The purpose of the design options is to inspire you to create a specific design, so you can customize a template if you love it. That’s how you create a logo with the help of AI. As more and more people use logo makers, the algorithms will only get better and better at predicting their needs and generating logos that fit their needs. 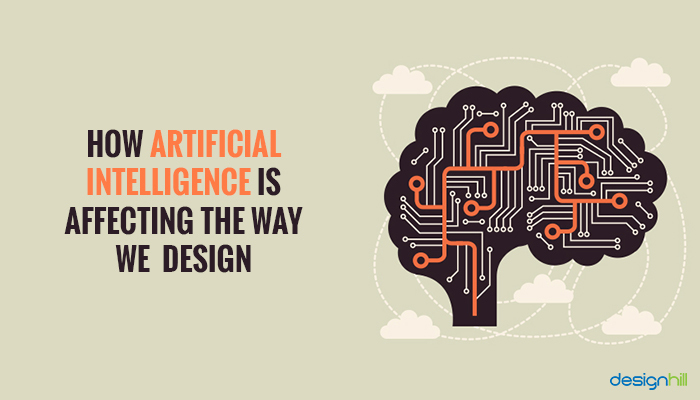 Ultimately, AI will make the design more accessible to both web designers and ordinary users who are trying to create a logo for their business, thus becoming a great assistant with design needs. And, don’t forget that a well designed and responsive websites help businesses to establish a brand identity and stay ahead in the fierce competition. AI-powered algorithms can be used to test an app without significant human intervention. For example, they can generate predictions for the essential app parameters and predict errors and inefficiencies by analyzing vast amounts of historical testing data. As a result, they can both increase the speed of testing and improve the effectiveness of the process. The evidence also suggests that AI will change software testing for the better. For example, the recent World Quality report claims that AI is quickly becoming one of the most important trends in software testing and QA. Here’s a stat from the report to back this claim: 64 percent of executives said they planned or already had AI projects in place for software testing. The report also outlined how AI is used to optimize software testing and QA in 2018. See the full list in the image below. 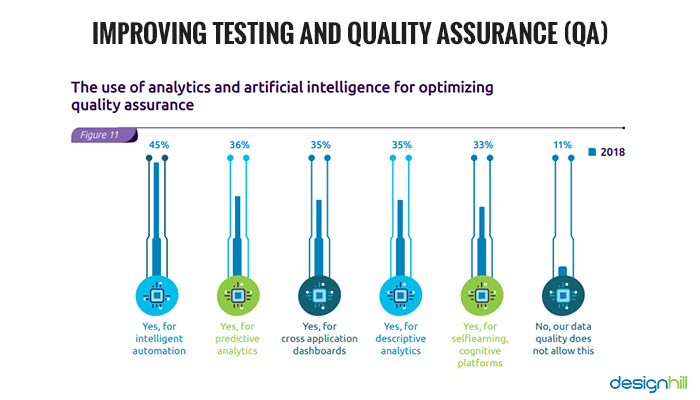 Evidently, companies are already applying AI-based testing and QA tools in many different areas, including intelligent automation, predictive analytics, descriptive analytics, and self-learning cognitive testing platforms. On the other hand, only 11 percent of the respondents claimed that their data quality didn’t allow using AI for testing. As more and more businesses will recognize the effectiveness of AI for testing and QA purposes, the technology will become a disruptive force in the industry. AI-powered algorithms will assess systems and auto-generate report, analyze the results of testing to identify and predict inefficiencies and errors, and complete many other related tasks. As a result, it will change the testing environment forever by making traditional approaches obsolete.